ABOVE: John Cobb driving his Napier-Railton Special at Brooklands in 1935. The car was powered by a 24-litre W12 aero engine. British watchmaker Farer has launched three new mechanical chronographs, each in honour of daredevil pioneering speedsters. The timepieces – designed in the UK with Swiss-made internals – salute the UK’s John Cobb, Ernest Eldridge, and Henry Seagrave. Cobb broke the land speed record in 1939, bettered it in 1947, and died on Scotland’s Loch Ness in 1952 attempting to break the water speed record. 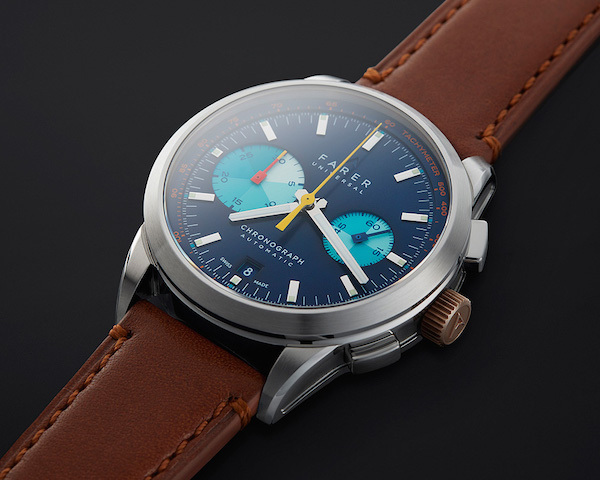 The Cobb watch has a matte sky-blue dial with inset sub-dials at 3 o’clock and 9 o’clock (small seconds and 30-minute chronograph counter, respectively) in split shades of aqua from light to dark. The seconds hand is a bright yellow that contrasts the dial’s blue tones. 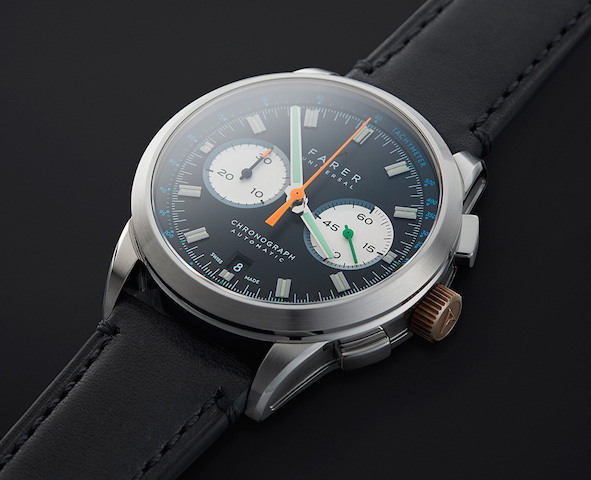 A tachymeter scale along the flange — a classic racing-inspired touch — has numerals and indices in orange. The second Farer watch honours Eldridge, who set the land speed record on an open road in 1924. He was an inveterate gambler who once lost 60,000 pounds sterling in a card game in Monte Carlo. The Eldridge watch has a brown dial with a blue second hard and blue sub-dial hand. The Segrave has pearly white sub-dials on a charcoal-black main dial. The hands and indices are thick and blocky — a contrast to the Eldridge’s Arabic hour numerals — and the central seconds hand stands out in orange. Green makes an appearance on the small seconds hand and blue marks the details of the surrounding tachymeter scale. Like its siblings, the watch has a date display in a window at 6 o’clock. 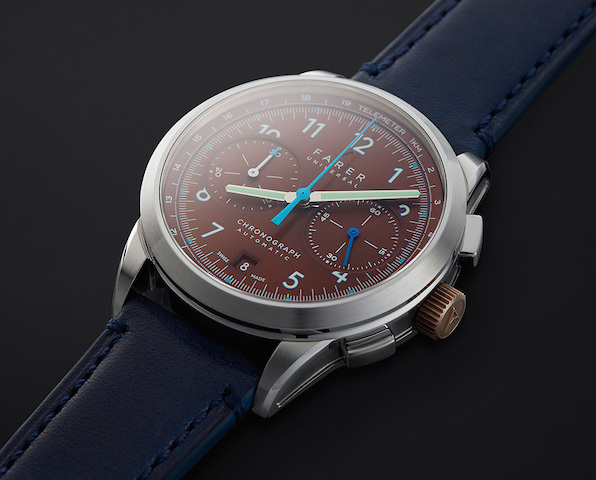 All three cases have a thin profile (just 12.5 mm) with drop lugs that secure the Horween leather straps, which are color-coordinated with the dials and details and which fasten with polished stainless steel buckles. Farer’s inbuilt strap mechanism allows the wearer to easily change straps without the need for a tool. Priced at $1950 in the US, the watches are available exclusively online at the brand’s website, farer.com. Farer was established in London in 2015.